Socrates In A Nutshell. What’s Wrong With Him? The Big Picture. Highest, and deepest reasons are not about the next micro-step done right. If it were so, ants would be the most reasonable organisms. Highest, and deepest reason is about getting the big picture right. Humanity is a social phenomenon, where we learn not from the gods (as Socrates believed), but from the wisdom piled up by others. Thus, taking care of others is taking care of wisdom. Somebody sent me mysterious messages I could not answer directly, coming to the defense of Socrates, telling me Plato was the real fascist, and that he, Plato, built up a fake Socrates, etc. Whatever: intellectuals have been in love, not to say awe, with Plato’s Socrates, fake or not. The fact the general amnesty was in the end overridden, just for Socrates, after the latter was to his old tricks, show that the “real” Socrates was surely anti-democratic, just like the “fake” one. Socrates depended upon his rich friends, boyfriends, and lovers’ money, the money of Athens’ golden youth. That makes his critique of the Sophists all the strangest, and reflecting an hypocritical mood. Verily, when thinking depends upon money, civilization turns into barbarity. Nobel laureate says his scientific breakthrough on the accelerating universe ‘would not be possible’ today. Saul Perlmutter says that there is a ‘fundamental misunderstanding’ of the purpose of research: ‘the current funding climate means researchers are “very good at not wasting any money and also not good at making any discoveries”. He won the Nobel Prize in Physics in 2011 after leading one of two teams that simultaneously discovered the accelerating expansion of the universe. We are coming onto a world where machines will do the work. A world in which machines will do most of what constitute work now. What will humans do, what should they do? They should think as deeply as possible, and that means as sincerely as possible. Socrates’ refusal to see when people, or a civilization, his civilization was drowning, is not the most educational paradigm to emulate. The age of robots & Artificial Intelligence will also be that of the deepest thinking, or won’t be. Because never have been the problems we can solve and have to solve, been as complex. The sustainability of the biosphere itself depends upon the deepest thinking imaginable, or won’t be. To strive towards the deepest methods, we have to eschew the Socratic method of cutting hair into pieces, somewhere out there, irrelevant to the situation at hand. Hypo-crisy means to be under-critical. By refusing to address what the problem really is, by claiming no animal knows anything, Socrates is not just ridiculous, he insults the very concept of brains, and thus civilization itself. That puts him roughly at the level of the Islamist State, and this is exactly what a jury of 2,000 of his peers in Athens decided. Revolutions spawn from, and contributes to, the revolutionary mood. It is no coincidence that many revolutionary ideas in science: Chemistry (Lavoisier), Biological Evolution (Lamarck), Lagrangians, Black Holes,, Fourier Analysis, Thermodynamics (Carnot), Wave Optics, (Young, Poisson), Ampere’s Electrodynamics spawned roughly at the same time and place, around the French Revolution. In the Encyclopedie, under the term dimension Jean le Rond d’Alembert speculated that time might be considered a fourth dimension… if the idea was not too novel. Joseph Louis Lagrange in his ), wrote that: “One may view mechanics as a geometry of four dimensions…” (Theory of Analytic Functions, 1797.) The idea of spacetime is to view reality as a four dimensional manifold, something measured by the “Real Line” going in four directions. Manifolds were defined by Bernhard Riemann in 1866 (shortly before he died, still young, of tuberculosis). A manifold is made of chunks (technically: neighborhoods), each of them diffeomorphic to a neighborhood in R^n (thus a deformed piece of R^n, see tech annex). Einstein admitted that there was a huge problem with the “now” in physics (even if one confines oneself to his own set-ups in Relativity theories). Worse: the Quantum changes completely the problem of the “now”… Let alone the “here”. In 1905, Henri Poincaré showed that by taking time to be an imaginary fourth spacetime coordinate (√−1 c t), a Lorentz transformation can be regarded as a rotation of coordinates in a four-dimensional Euclidean space with three real coordinates representing space, and one imaginary coordinate, representing time, as the fourth dimension. The first equation exhibits universal time: time does not depend upon the frame of reference. But notice that the second equation mixes space and time already. 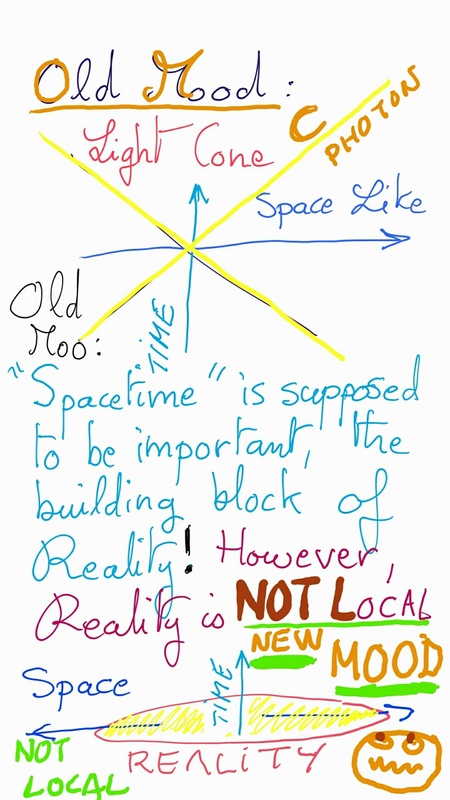 Thus, philosophically speaking, proclaiming “spacetime” could have been done before. Now, in so-called “General Relativity”, there are problems with “time-like” geodesics (but they would surface long after Minkowski’s death). In any case, I hope this makes clear that, philosophically, just looking at the equations, “spacetime” does not have to be an important concept. And Quantum Physics seems to say that it is not: the QUANTUM INTERACTION (QI; my neologism) is (apparently, so far) INSTANTANEOUS (like old fashion time). As we saw precedingly (“Can Space Be Faster Than Light“), the top cosmologists are arguing whether the speed of space can be viewed as faster than light. Call that the Cosmic Inflation Interaction (CII; it has its own hypothesized exchange particle, the “Inflaton”). We see that c, the speed of light is less than CII, and may, or may not be related to QI (standard Quantum Physics implicitly assumes that the speed of the Quantum Interaction QI is infinite). One thing is sure: we are very far from TOE, the “Theory Of Everything”, which physicists anxious to appear as the world’s smartest organisms, with all the power and wealth to go with it, taunted for decades. Tech Annex: R is the real line, RxR = R^2, the plane, RxRxR = R^3 the usual three dimensional space, etc. Spacetime was initially viewed as just RxRxRxR = R^4. ]What does diffeomorphic mean? It means a copy which can be shrunk or dilated somewhat in all imaginable ways, perhaps (but without breaks, and so that all points can be tracked; a diffeomorphism does this, and so do all its derivatives). Nature is not nature, ever since there are humans, and they think. Earth has been terraformed, made into a garden, a human garden, in the last few million years. By ours truly. Neanderthals started to used coal (lignite), 80,000 years ago.They also domesticated (that is, modified) European wolves, and invested in real estate, by exterminating Cave Bears. Thus, following “nature” is a non-linear activity, as, by following nature, we also follow the new nature we deconstructed and rebuilt, that is, we follow ourselves. The simplest thing is to view all causes as constant. 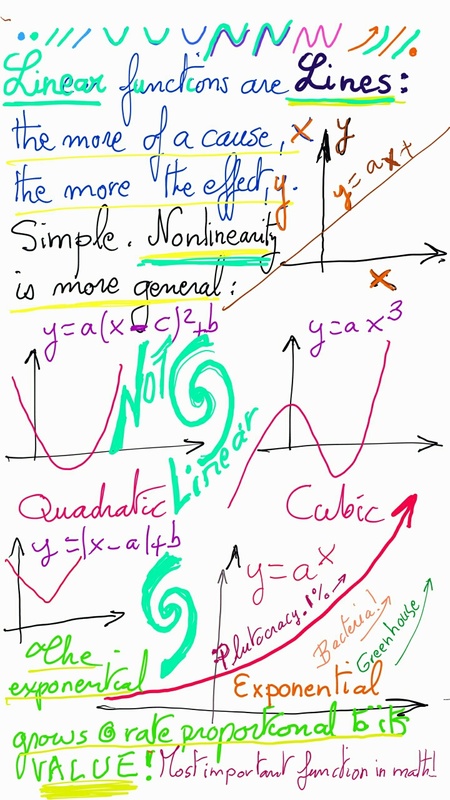 The next simplification is to view them as linear. After that quadratic, cubic, and all powers etc… The exponential, an infinite sum of powers with fast decreasing coefficients, grows as fast, at any point, as its own value. So it’s all over nature. “Following nature” thus does not just mean hugging trees. It also means dealing with trees the old fashion way: cutting and burning them, to favor plants and animals human beings were involved with (fires in Indonesia are contributing at least one gigaton of carbon to the atmosphere in 2015, making them an appreciable source of CO2). “Following nature” also means using genetic engineering on plants and beasts alike. Nature has been artificial from even before the rise of civilization. Prehistoric men in Europe already conducted advanced and successful surgeries, from trepanations, to amputations, complete with anesthetics and antibiotics (parts of that knowledge got completely forgotten during the European Middle Ages… to this day!) “Facts” nowadays are all what influences humans, because they, in turn, change nature. Including hopes, systems of mood (“austerity!”, “Islam!”). Human evolution discovered, so to speak, this virtuous spiral of understanding and behaving. The species modified itself accordingly, it became that spiral. it is now more energetic than ever. One cannot read morality straight out of scientific facts, because facts are about the world, and the world is about what we constructed. Thus the calculus of human hope, desire and risk evaluation has to be factored in… And it keeps on changing, the more it reflects on the agitated waters of its darkest soul. Fundamentally, then, the human species is immensely adaptative (see future Martians): to act, human agents consider human minds, and what their activities wrought (nature). We can call ourselves new names, but our new game is the same as our old game: changing the rules as we see fit, the more we learn, and the more we change nature. Translation: our presumed influence on the universe is so vast, subtle and pernicious, that quasars apparently receding much faster than the speed of light, are called to the rescue of physicists who want to make sure they reach beyond man, to an unspoiled universe. We are everywhere we look, at least in our terrestrial neighborhood. Everywhere we reach, human influence has already changed everything. It’s not just about the melting icecaps. If you know where an arrow is, you know everything about its physical state…. Classical Mechanics found the first point to be erroneous. To know the state of a particle, one must know not only its position X, but also its velocity and mass (what’s called its momentum P). Something similar happens with Quantum Physics. To know the state of a particle, we need to know whether the state of what it has interacted with before… exists, or not. According to old fashion metaphysics, that’s beyond weird. It’s simply incomprehensible. The EPR Interaction: Zein Und Zeit. For Real. Highly predicting classical mechanics is the model of Einstein Sanity. Aristotle had ignored the notion of momentum, P. For Aristotle, one needed a force to maintain motion (an objective proof of Aristotle’s stupidity; no wonder Aristotle supported, and instigated, fascist dictatorship as the best system of governance). Around 1320 CE, the Parisian genius Buridan declared that Aristotle was completely wrong and introduced momentum P, calling it “IMPETUS”. May we be in a similar situation? Just like the Ancient Greeks had ignored P, is Quantum Wave Mechanics incomplete from an inadequate concept of what a complete description of the world is? Einstein thought so, and demonstrated it to his satisfaction in his EPR Thought Experiment. 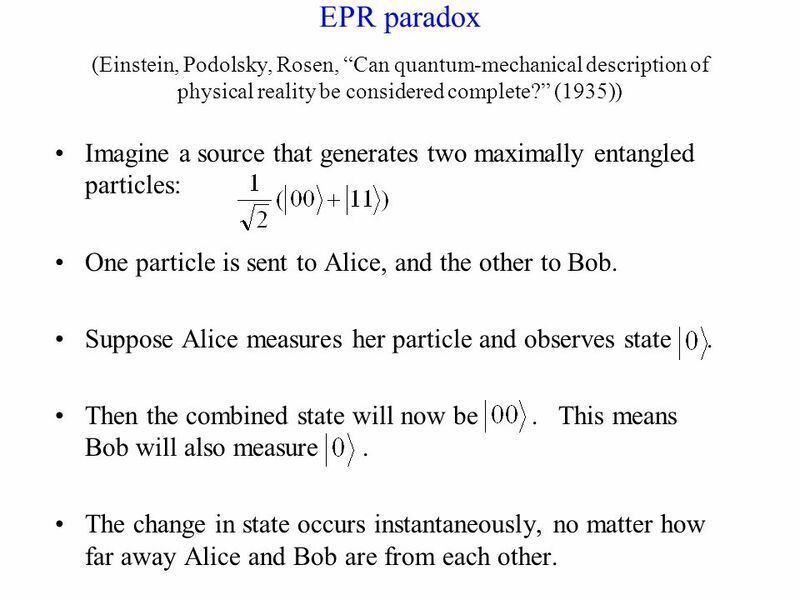 The EPR paper basically observed that, according to the Quantum Axiomatics, two particles, after they interacted still formed JUST ONE WAVE. Einstein claimed that there had to exist hidden “elements of reality”, not yet identified in the (Copenhagen Interpretation of) quantum theory. Those heretofore hidden “elements of reality” would re-establish Einstein Sanity, Einstein feverishly hoped. According to Einstein, following his friend Prince Louis De Broglie (to whom he had conferred the Doctorate) and maybe the philosopher Karl Popper (with whom he corresponded prior on non-locality), Quantum Mechanics appears random. But that randomness is only because of our ignorance of those “hidden variables.” Einstein’s demonstration rested on the impossibility of what he labelled “spooky action at a distance”. That was an idea too far. The “spooky action at a distance” has been (amply) demonstrated in the meantime. Decades of experimental tests, including a “loophole-free” test published on the scientific preprint site arxiv.org last month, show that the world is like that: completely non-local everywhere. The EPR Thought Experiment established the faster than light influence (and that was checked experimentally). But then some properties cannot exist prior to “EPR style influence”. Because, if they did, why do they have no influence whatsoever, once the EPR effect is launched? Now visualize the “isolated” “particle”. It’s neither truly “isolated” nor truly a “particle”, as some of its properties have not come in existence yet. How to achieve this lack of existence elegantly? Through non-localization, as observed in the one-slit and two-slit experiments. Why did I say that the “isolated” “particle” was not isolated? Because it interfered with some other “particle” before. Of course. Thus it’s EPR entangled with that prior “particle”. And when that “particle” is “measured” (namely INTERACTS with another “particle”), the so-called “isolated” “particle” gets changed, by the “spooky action at a distance”, at a speed much faster than light. All these questions are extremely practical: they are at the heart of the difficulties in engineering a Quantum Computer. Old physics is out of the window. The Quantum Computer is not here yet, because the new physics is not understood enough, yet. “It is inconceivable that inanimate Matter should, without the Mediation of something else, which is not material, operate upon, and affect other matter without mutual Contact…That Gravity should be innate, inherent and essential to Matter, so that one body may act upon another at a distance thro’ a Vacuum, without the Mediation of any thing else, by and through which their Action and Force may be conveyed from one to another, is to me so great an Absurdity that I believe no Man who has in philosophical Matters a competent Faculty of thinking can ever fall into it.”—Isaac Newton, Letters to Bentley, 1692/3. 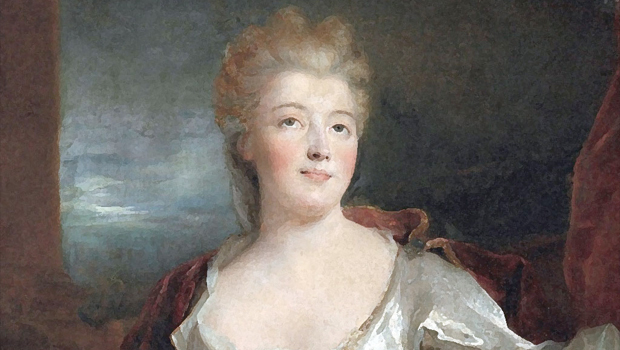 Every Quantum process contradicts Locality, thus, Émilie Du Châtelet would say, Locality is a false hypothesis. Gravitation got better described (not much) by making gravitation into a field propagating at the speed of light. It is not a trivial modification: it immediately predicts gravitational waves. If two huge star like objects (such as pulsars) rotate around each other, they should generate such waves, they should carry energy away, and those two objects ought to fall towards each other at a predictable rate. Said rate is indeed observed, thus Einstein’s gravitational equation (obtained by talking a lot with others, such as Hilbert, Grasso, etc.) seems correct. Einstein’s main motivation for his theory of “General Relativity” was that he wanted to explain inertia (why fast rotating planets develop a bulge at the equator, or more generally an acceleration VV/r). That worry, called Mach’s Principle, actually originated 100% with Newton. Newton put water in a pail, twisted and twisted and twisted a rope from which the pail was suspended, and let go: the pail rotated faster and faster, and the water inside crawled up. Einstein basic wishful logic was that: gravitation = inertia (he called that the “Principle of Equivalence”). So, by making a theory of gravitation, Einstein would make one of inertia, and become a giant among giants (of Du Châtelet’s caliber, say). Silly. Silly idea, doomed to fail. Why silly? Once gravitation was made into a field, Einstein and company made it into curvature in a manifold (called “spacetime”; the basic idea was elaborated by genius Riemann, two generations earlier, although implicitly attributed to Einstein by the ignorant ones). So gravitation is locally determined: once at a point A, gravitation, that is, curvature of spacetime, is determined in a(ny) neighborhood of A (call it N). The distant stars do not influence N much, if at all. Yet, inertia is clearly determined by the distant galactic clusters. Einstein could not understand this. But now physicists understand better Einstein was deluded, and (Soviet physicist) Fock’s critique that Einstein’s General Relativity is just a theory of gravitation is universally (albeit silently) accepted. All this to say that I am not shocked by Non-Locality: I just have to go out, and look at the stars, move about, and I see Non-Locality. Many, if not most physicists are horrified by Non-Locality. Philosophically, though, being afraid of Non-Locality makes no sense. Once I was broaching Quantum Physics with my dad. I explained what I understood of the problem of Non-Locality to him. My dad did not know much physics, but he was a scientist. Admitted to the famed ENA (the school of conspirators from which the present leaders of France come from), he declined it, and, instead, following the path of his own father, an amateur-professional geologist, he himself became a (highly successful) non-academic geologist (he discovered Algeria’s fortune). With this philosophical perspective, the following arise: physical space is not made of points (although Quantum Field Theory is, one of its many problems). When physicists talk about Non-Locality, they feel the urge to get into the “Bell Inequality”. But it’s a convoluted, over-specialized, contrived way to get at Non-Locality (I say this, although I respect the late John Bell as much as I despise Feynman when he tried to steal Bell’s work… Although, in general I do respect and love Feynman, especially in light of his appreciation for my own ideas). Bell theorem says that some Local Hidden Variable theories imply an Inequality that Quantum Physics violate. So Bell’s is a work which predicts that something false is not true. Suppose you want to know where an object is. Suppose all you have is touch. So you kick it. However, if you kick it, it goes somewhere else. That’s the Uncertainty Principle. Why touch? Because light is touch. It turns out that light carries energy and momentum. Anybody who lays in the sun will agree about the energy. To demonstrate the momentum of light requires a bit more experimental subtlety. Could you kick the object gently? No. That’s where the Wave Principle kicks in. Waves ignore objects which are smaller than themselves: they just turn around them, as anybody who has seen a twenty meter tsunami wave enter a Japanese port will testify. So, to detect a small object, one needs a small wavelength, high frequency wave. However the energy of a Quantum wave (at least a light wave) is proportional to its frequency. So the more precise the determination of (position of) the object, the higher the frequency of the wave, the greater the energy and momentum conferred to the object, etc. Fundamental hypotheses in contemporary physics are conservation of energy and momentum (something the Multiverse violates, thus, into the bin of silly ideas). So say two particles, such as a positron-electron pair, are created together and have total momentum zero (a completely realistic situation: machines do this, for medicine). Knowing the momentum of (say) the electron E, gives that of the positron P (the vector is exactly opposite to that of the electron). Classical and Quantum mechanics say the same. However, the basic set-up of Quantum Physics says that the measurement create the state (my formulation, you will not read that in textbooks, although it’s clearly what Bohr wanted to say, but he did not dare, lest his academic reputation gets vilified: he had only a Nobel Prize in physics, after all…). So the state of P, maybe a few light years away, was created by measuring E.
The basic Quantum set-up was designed for laboratory experiments, not Cosmological Quantum effects. So it did not need to consider all the consequences of this. Following Du Châtelet, I will say that we are in obvious need of a new hypothesis, the QUANTUM INTERACTION (ex “Collapse of the Wave Packet”). It explains what we observe (instead of trying desperately to say that we cannot possible observe what we observe). Following Newton, I will say it is absurd to suppose that the effect of E on P is instantaneous. So this Quantum Interaction goes at a speed I call TAU (it’s at least 10^10 the speed of light: 10,000,000,000 times c). New physics coming to a Quantum Computer near you. And of course , said new physics will have giant impacts on philosophy (be it only by presenting new models of how things may be done), or Free Will (is it really free if it takes its orders from Andromeda?). This is going to be fun. 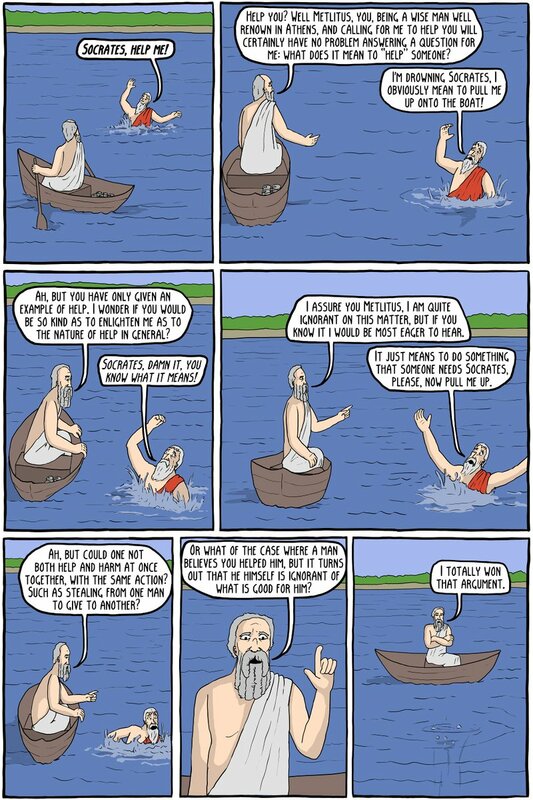 The author says: “The philosophical problem of identity is epitomized by the paradox known as the “Ship of Theseus.” Suppose a ship is rebuilt by removing one plank at a time, and replacing it with a new plank of the same shape and material. Is it still the same ship?… suppose all the planks that were removed are brought together and used to construct a new ship of identical form. Wouldn’t it be more appropriate to say that is the same ship as the original, and the one with new planks is a duplicate? There is no easy answer. Every possible reply seems to lead into a morass. It’s telling that the author evokes as authorities enslaving, racist “philosophers”. Those “philosophers”, or shall we call them racist slave masters? to sell their enslaving and racist philosophy, had to make us all stupid, and this is an esoteric example. In truth, there is no morass whatsoever. In the old theory of atoms, the one Lucretius wrote a poem about, 2,000 years ago, atoms were all the same. So one could imagine a morass. However, astoundingly, Quantum Physics has given us back a strong notion of identity. So strong it is, that Quantum Physics can be used to tell us if a message, a message which looks completely intact, has been read (this is the essence of “Quantum Cryptography”). “Most people just adopt their philosophical identity without examining it. Thus millions of people are basically mental clones, philosophically speaking, and have no real Free Will, or personal identity (see the Islamic state). However that does not mean one can extend the principle of replication to the real world. Twenty-five centuries old considerations and Star Trek are not the most up to date references. Anybody with a serious knowledge of Quantum Physics would doubt that duplication is possible. Indeed replication requires the full inspection of the element to be duplicated. That’s impossible, from the so called Heisenberg Principle, the Uncertainty Principle intrinsic to waves. Indeed, in Quantum Physics, the no-cloning theorem forbids the creation of identical copies of an arbitrary unknown quantum state. It was stated by Wootters & Zurek, and Dieks in 1982. It has profound implications in quantum computing. The state of one system can be entangled with the state of another system. One can entangle two qubits. This is not cloning. No well-defined state can be attributed to a subsystem of an entangled state (this is the essence of the Schrodinger/Einstein cat). Cloning is a process whose result is a separable state with identical factors. Publication of the no-cloning theorem was prompted by a proposal of Nick Herbert for a superluminal communication device using quantum entanglement. Cloning would violate the no-teleportation theorem, which says classical teleportation (not to be confused with entanglement-assisted teleportation) is impossible. So sorry, physics says: no double Perseus ship, and no double Kirk. Quantum States are NOT all that we are, but they are a great part of what we are. Real duplication would imply duplicating them, and that cannot be done. Besides, saying that a “rock at two different times is in quite different quantum states, but it is still the same rock,” is, with all due respect, not correct. Let’s call the quantum states lx>. According to the Hilbert axiomatics of QM, the rock is going to be: SUM over Ix> [(f(x;t) Ix>]. There t is one group parameter of transformation (known as” time”). Thus the isolated rock is always in the same quantum states, although the mix may vary according to t, unbeknownst to us (this is the essence of the quantum cat paradox). A rock at different times will be found in different quantum phases, but the same quantum states (this is the essence of the 2012 Nobel Prize in Physics given to Haroche from Ecole Normale Superieure Paris). Quantum Physics has enormous implications even for something as simple as “identity”. Moreover, those implications are still under development. If they were not, we would already have Quantum Computers. But we do not. Yet we know that biology can Quantum Compute. How? Birds can see the Earth’s magnetic field. That is only possible if birds use Spintronics, a type of Quantum Computing that barely works occasionally a bit in the lab, at very low temperatures. Birds use it, in the wild, at room temperature, and see very well, thanks to it. Louis XIV was a famous mass butcher of people he insulted as “heretics“, a great destroyer of Europe, let alone France. A direct descendant of Louis XIV, the “king” of Spain, has just abdicated, so that his son can also become plutocrat-in-chief (Rey, Roy, King, Koenig). People love to follow. The Spanish herd, in a further act of humiliation, is supposed to bleat its approval. When the dying king of Spain named the grandson of Louis XIV king of Spain, the fanatical Guillaume of Orange from the Netherlands, who had just conquered England, according to his plan of attack of Louis XIV, had a pretext to organize a world coalition against France-Spain. 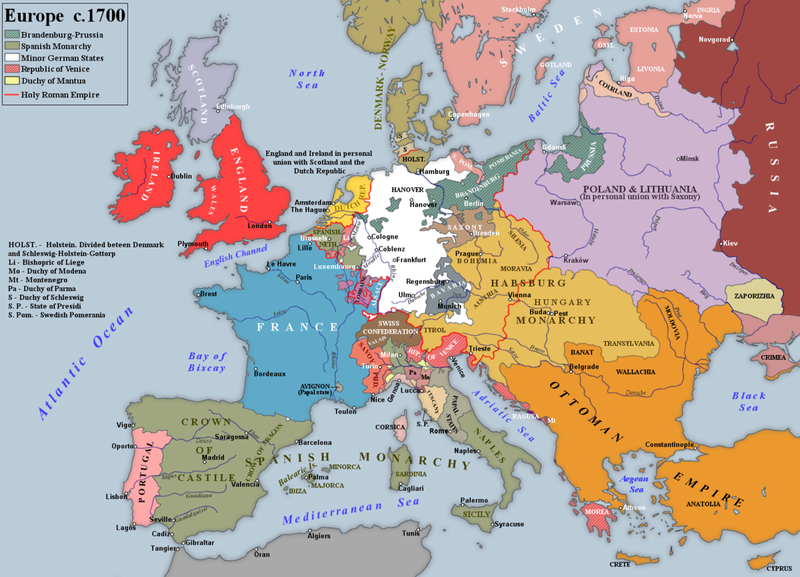 The resulting folly, the “War of the Spanish Succession” killed millions over 13 years. Minds Are Multiverses. Yet, That’s It. The mania of crowds is a great thing to watch. In the Middle Ages, those viewed as the wisest and most knowledgeable pondered the number of angels on a pin. Their modern alter egos, are much more advanced; instead of wondering about how many angels, they answer: an infinity of universes. What could go wrong? Alexi Helligar, a participant on this site kindly provided is with a video of a celebrity physicist from Harvard, talking at Oxford. Thank. It looks like physics, just as climate science financed by the Koch brothers looks like science. Alexi told me I was “naive” to believe that there was any conspiracy involved. Yet that was after telling me that the celebrity physicist was a genius of our time. He is, thanks to a conspiracy. For short, we call him “the Celebrity”. The Celebrity is financed to the tune of several million dollars by one hedge fund plutocrat. That’s while true science is starving in the USA. But of course the Celebrity, now a fabricated genius, is, by his very existence, a testimony to the glory of the hedge fund “industry”. Expect him to sing its praises. His very behavior breathes the self assurance of a hedge-fund manager. Maybe Wall Street ought to be give him a Nobel, as he did nothing but talk pretty, just as Obama. You see, physics has several entangled problems. The Big Bang theory needs “Cosmic Inflation” and inflation of space happening at a speed I call “TAU”, around ten billion times the speed of light. Because the Universe is just way too big, to be the result of just the Big bang without Inflation. However, Inflation theory, as it stands, creates universes all over the place. Why? Because the Inflation scenario, as envisioned, arises from Quantum fluctuations, and creates a universe without energy expenditure. If it can create one universe that way, it can create zillions. So how come we see just one universe, the Universe? Inflationistas tells us that we have to be somewhere. Yes, sure. But then it turns out, in this universe full of universes, that a universe with us is exceedingly rare. Universes with “zombie brains” would be more likely. It’s all, of course, sheer insanity. And it’s easy to spot: just as inflationistas which kind of particles existed during Inflation. Well, they didn’t even think about it. Recently, some of those space fantasy authors suggested that one needed an “observer” to have particles, ergo, there were now particles during inflation, only Inflatons (the excitation of the Inflation filed, neither of which have been observed). Presto, no more zombie brains! That “breakthrough” was applauded in Harvard, MIT and Oxford. At least it makes comic reading. Arkani-Hamed, to name the Celebrity, has been saying for a decade, that the Large Hadron Collider compels us to believe that the small value of the Higgs mass (in Planck units) indicates “fine-tuning” that can only have an anthropocentric explanation. In that case, we live in a multiverse, with physics determined by something like the string theory landscape. About this whole conceptual framework, he says the “ideas are so poorly defined, not clear if they make any kind of mathematical sense”, and it’s “not clear progress will happen anytime soon” but, no need to worry or get discouraged, since this is an “attractive problem”. (David Gross, a physics Nobel called that “giving up”). Philosophically, to expect that man gives rise to the universe is beyond absurd. Instead of believing that there is a god creating the universe, now it’s man who is god, and creates the universe. That the problem originated with Niels Bohr and company is no excuse. It’s the angel-on-a-pin absurdity again, made worse, once again. Those people don’t even have the excuse of living in the Middle Ages. This clash between self-assurance and completely fishy ideas, is giving physics a bad name. As I have explained in “100 billion years old Universe”, the Big Bang is not needed anymore: Dark Energy can do it all. The entire expansion, that is. Dark Energy is serious physics, based on facts, not wishful fantasy. It was guessed way back, from carefully going through the experimental and logical evidence (I. Segal, etc.). Similarly for Dark Matter. Today’s physics explain neither. Standard high energy theorists were busy denying either were worthy of interest. However, today’s new, experimental, evidential physics present potential explanations for other aspects that only the Big Bang was supposed to explain. In particular, Black Holes in the center of galaxies generate huge amount of localized energy: as matter falls into them, it heats up enormously. I suggested this would prevent serious life to arise in the center of galaxies. Could that be used to generate elements such as Helium? We don’t know. But that deserves to be studied. That’s serious physics. When there is so much to do, “extrapolations on top of extrapolations on top of extrapolations”, as the Celebrity physicist himself recognizes, is certainly a way to invent new physics. But, when it is presented as what physics say the world is, it’s no way to impress the fragile minds of some members of the public, who can’t tell an equation from a degeneration. To forcefully present to the public deranged fantasy as if it were physics, is just encouraged the gullibility of crowds, and the madness of the herd (no wonder hedge funds managers fund that to give critique a new foundation!). Meanwhile, stand reassured, you who attach worth to sanity: there is just one universe out there. It’s much bigger, much older than Celebrity physicists have it. And it is NOT girl watching that creates it. To believe that human gaze creates all, is just a collective Freudian slip of thousands of physicists who cannot really believe that the Universe makes sense, as their PhD theses surely do not. What’s nature? Many cultures, in the last two million years, identified nature to God(s). What’s god? The end-all, be-all. Assuredly nature fits the bill. A more constructive point of view is to introduce the notion of computer. Nature is a computer, and the universe the set of all solutions. The notion of computer is not really new: the Greeks had very elaborated mechanical computers. They used it to predict the motions of celestial objects. As I have argued in “ULTRABIOLOGY”, the 2,500 year old notion of computing has become obsolete. It turns out that Nature is a QUANTUM computer. What’s the Quantum about? As I argued in QUANTUM WAVE, the Quantum is about emitting and receiving energy by packets, while transmitting it as waves. A world of waves? It’s going to be fuzzy, because stopping a wave with a wave is not going to be work too well, or be instantaneous. So Quantum waves tend to go through walls a bit. Indeed, the wave equations proposed to depict Quantum processes are always characterized by having a potential on the right-hand side. Even if the potential changes abruptly, the wave will not. This is what the “Tunnel Effect” is all about. 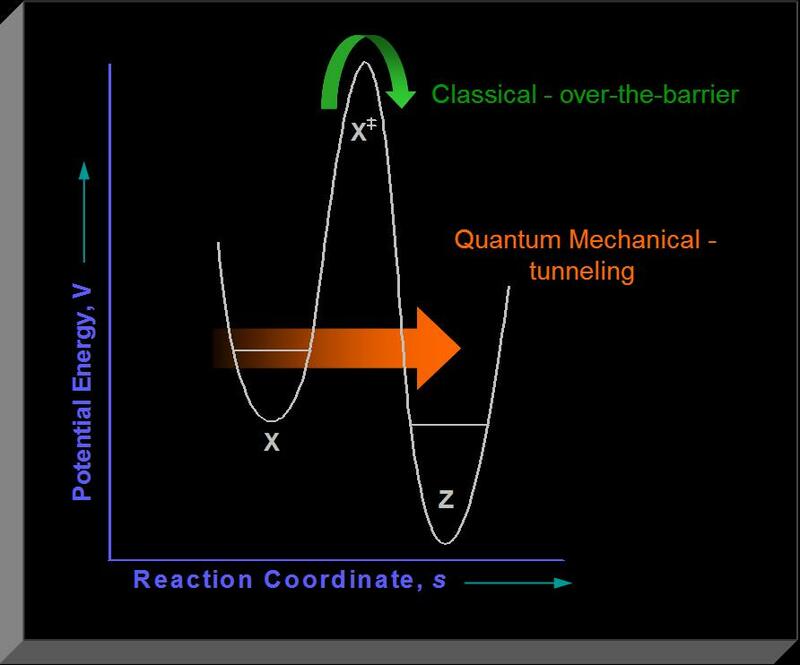 Matt Strassler wrote an excellent article on Quantum tunneling (abstracted in The Amazing Feat Of Quantum Tunneling). Here are some extracts, although readers are encouraged to read the much more complete original. Why? Because waves are always moving and waves are never really local. A trap for an electron, which is like a bowl for a marble. (Left) Normal life would lead us to expect that the electron, like the marble, would be stationary if placed at the center. (Right) But quantum `jitter’ assures that the electron is always slightly in motion, and never quite at the center for more than an instant. A blue fuzz evokes the fact that the electron is, in some sense, spread out around the center of the trap. If I put an elementary particle like an electron in a magnetic trap that acts like a bowl, tending to push the electron toward the center just the way gravity and the walls of the bowl push the marble toward the bowl’s center in Figure 1, then what is a stable location for the electron? Just as you would intuitively expect, the electron’s average position will be stationary only if I place the electron the center of the trap. 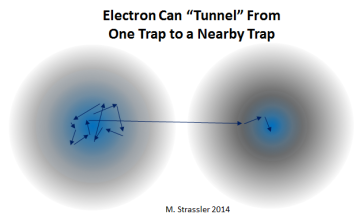 “Only the average position of the electron is at the center of the trap; if you look for the electron, you’ll typically find it somewhere else in the trap, near but not at the center. And the electron is only stationary in the following sense: it’s typically moving, but its motion is in a random direction, and since it’s trapped by the walls of the trap, on average it goes nowhere. That’s a bit weird, but it just reflects the fact that electrons aren’t what you think they are, and don’t behave like any object you’ve ever seen. By the way, it also assures that the electron cannot be balanced on the edge of the trap, in contrast to a marble on the edge of a bowl (as in Figure 1, bottom). The electron’s position isn’t sharply defined, so it can’t be precisely balanced; and so, even without the trap being jiggled, the electron would become unbalanced and almost immediately would fall off. But the weirder thing is what happens if I have two traps, separated from one another, and I put the electron in one trap. 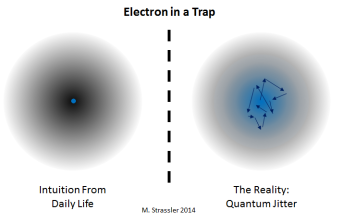 Yes, the center of either trap is a good stable location for the electron. That’s still true… in the sense that the electron can stay there and won’t run away if you jiggle the trap. How did it do that? If you imagine that electrons are like marbles, you will not be able to understand this. But electrons are not like marbles [or at least not like your intuitive notion of a marble], and their quantum jitter offers them an extremely small but non-zero probability of “walking through walls” — of going someplace that it would seem impossible for them to go — and ending up on the other side. This is called, poetically, “tunneling” — but you should not imagine that the electron digs a hole through the wall. And you’ll never catch the electron in the wall — in the act, so to speak. It’s just that the wall isn’t completely impermeable to things like electrons; electrons are not things that can be easily trapped. Actually, it’s even crazier than this: because what is true for the electron actually is true for the marble in the bowl. The marble could end up in bowl 2, if you could give it enough time. But the probability of this happening is extremely extremely extremely small… so small that if you waited billions of years, or even billions of billions of billions of years, that still wouldn’t be enough. For all practical purposes, it will “never” happen. The point is that our world is a quantum world, and all objects are made from elementary particles and are subject to the rules of quantum physics. Quantum jitter is ever-present. But for most objects that have a lot of mass compared to an elementary particle — a marble, for instance, or even a typical speck of dust — this quantum jitter is too small to observe, except in very specially designed experiments. And the consequent ability to tunnel through walls is also, therefore, never seen in ordinary daily life. Knowing about such things as the preceding, and knowing as they fit with different appearances, and knowing how we found them out, is what makes our wisdom different from that of the Ancients. Not just a different knowledge basis, but also a different meta-knowledge basis (how we established that knowledge). Just as drastically, recent bits of science provide us with new models for thinking in general. For example, tunneling implies that there are no absolute separations, and that, instead, interpenetration makes the real world hold together well. That’s why students of philosophy that have learned nothing new in the last few centuries, ought not to be taken too seriously. Even on poetry, tunneling ought to have an impact. Tunnel Effect: if you want to be real, you have to dig it.